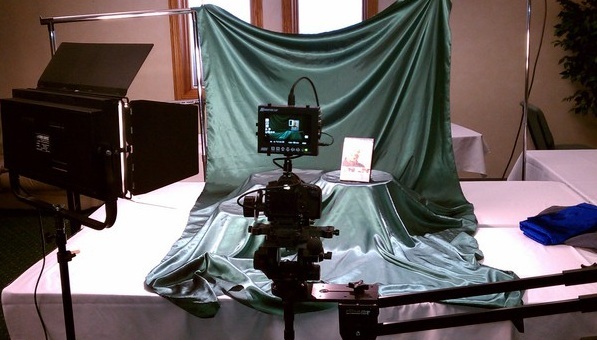 Today I was setting up for a small shoot where we would be showcasing a few products for at the end of an infomercial. Here’s a quick BTS tour of how I set things up and a few workarounds I was forced to make. View in HD on Facebook. Here’s a picture of everything setup with the backdrop. Like us on Facebook for more BTS videos and follow me on Twitter for more BTS photos. Thanks for the bts. Have you every did a comparison with cool lights fluoresents vs. Kino flo diva lights. Do you think the kino flo diva lites will give you a different look in this shot? I haven’t worked with the Kino Flo Divas, only the large 4 bank models. Kinos are great, but expensive. I’ve worked a lot with the Cool Lights and the cheap Chinese versions. They are good if your budget is tight.